Last year, we looked at the extreme cuts to international climate finance the Trump administration put forward in their fiscal year 2018 budget proposal. Based on Trump's announcements, one might assume that U.S. climate finance has fallen to zero. Luckily, this is not the case. It is Congress that sets funding priorities in annual appropriations bills. Six months overdue, Congress has finally agreed an omnibus spending package to fund the entire government for FY18 (covering October 2017-September 2018). For climate finance the budget is a mixed bag: some international climate funding has been preserved, some cut, and much left to the discretion of government agencies. Global Environment Facility (GEF): $139.5 million. Provides support not just for climate, but a host of environmental challenges, such as protecting biodiversity and tackling desertification. The US is the second-largest contributor in the GEF's current 4-year funding cycle, after Japan. Funding has been largely preserved, and stands at $7 million less than FY16 and 17 levels. Montreal Protocol Multilateral Fund: $31 million. Supports developing countries to phase out ozone depleting substances, some of which are powerful greenhouse gases many times more potent than carbon dioxide. Funding is $1 million below FY17 levels, but the money that has been approved will have a big impact, increasing the fund's available resources by 38 percent. That said, for anyone who prioritizes climate action, the FY18 Appropriations Bill is far from good. 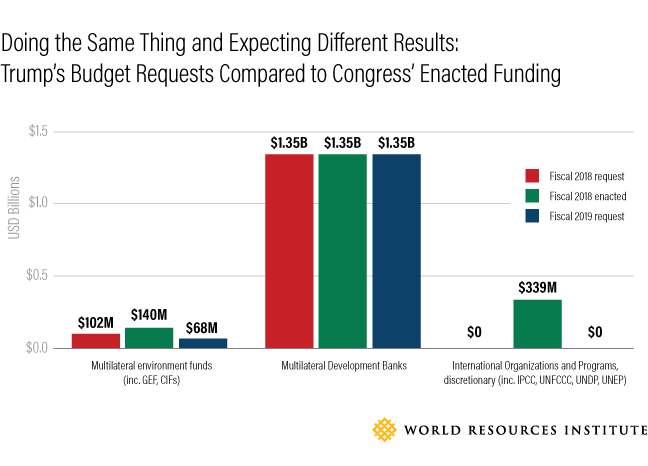 Congress has failed to find funding for critical global climate institutions. Green Climate Fund (GCF): $0. The largest and newest international climate fund receives no funding. The Obama Administration pledged $3 billion to the fund in 2014, paying two $500 million installments in 2016 and 2017. This leaves $2 billion still due, nearly 20 percent of the fund's $10.3bn in total pledged funding. The GCF is doing important work: the 76 projects it has approved so far will avoid 1.3 billion metric tonnes of carbon dioxide emissions while increasing the resilience of 217 million people to climate impacts. Congress' failure to support the GCF undermines U.S. influence over the fund's direction, as well as their credibility in international negotiations. Intergovernmental Panel on Climate Change (IPCC) and the UN Framework Convention on Climate Change (UNFCCC): No allocation. These bodies are responsible for synthesizing the state of the art of climate science and providing a space for climate diplomacy. Funding was cut completely in the FY17 budget. This led a number of European countries to increase their funding, and Bloomberg Philanthropies to pledge $15 million to make up for the U.S. shortfall. In a positive move, the Trump administration has said it now wants to fund these bodies. The House of Representatives didn't seem to get this memo, rejecting the Senate's bipartisan recommendation to restore FY16 funding levels of $10 million. The administration could, however, still fund the UNFCCC and IPCC from discretionary funds. One of the biggest challenges in assessing the bill's implications is that not all spending on climate is clearly determined upfront. 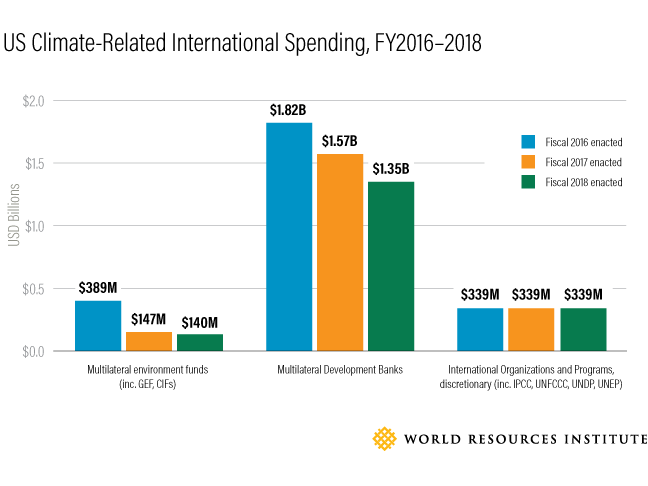 Allocations to international funds are important, but a larger amount of U.S. climate finance goes through bilateral channels, primarily the State Department and the US Agency for International Development (USAID). Overall allocations to the Development Assistance and Economic Support Fund accounts , used to fund State and USAID's work, have increased slightly. However, the amount of this that will go towards climate activities is not Congressionally-mandated, so it falls to the discretion of the executive branch. The Overseas Private Investment Corporation's (OPIC) budget also remains intact. OPIC has been investing an average of $1 billion a year in renewable energy since 2010, the largest single element of U.S. international climate finance. Not only is this helping deploy renewable energy around the world, but returns on these investments help reduce the federal deficit. The U.S. is also a major contributor to the multilateral development banks (MDBs), which have their own goals for scaling up climate finance. Although the FY18 budget provides 14 percent less to the MDBs compared to FY17, this was anticipated since the U.S. had already paid up most of its pledged capital increases in earlier years. How will the State Department and USAID spend bilateral development funding? Will staff be guided by recipient country priorities and expert analysis that shows climate action and sustainable growth go hand in hand, or will they be subject to political interference? There are concerning signs: last year, then Secretary of State Rex Tillerson announced the abolition of the Office of the Special Envoy for Climate Change, which had played a key role in coordinating the State Department's climate work. Will OPIC (or its successor organization) retain its cap on its portfolio greenhouse gas emissions, which has helped encourage the organization to pursue more renewable energy investments? Will the U.S. agitate for multilateral development banks (MDBs) to roll back their climate work? The Treasury Department has already issued new voting guidance to its MDB representatives, directing them to "Help countries access and use fossil fuels more cleanly and efficiently," and has abolished its Office of Energy and Environment, which developed U.S. positions on MDB climate policy, as well as represented the U.S. in the GEF and GCF. Merging the Development Assistance and Economic Support Fund accounts to hide steep funding cuts and evade Congressional oversight. Yet by failing to address the concerns voiced by both parties of Congress regarding the implications of the FY18 proposal for U.S. foreign policy, next year's request looks dead on arrival.